The image of the Green Man, a face, almost always male, associated with leaves, is an ancient symbol of our unity with Nature. This symbol is now understood in an explicit way that was never before possible. Its use in the past seems to have been entirely intuitive: no written account of the image has yet beef found from any culture. 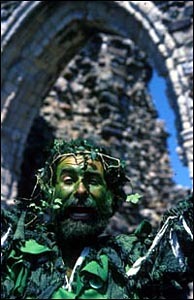 The idea of the Green Man is a modern perception of the identity between several cultural strands: the carved images in churches, temples and folk art, a group of early tree legends, the folk customs involving a figure clad in leaves, usually Spring regeneration customs, the concept of the "wild man", ancient survivors living in the forests, the Robin Hood stories, the Gawain and the Green Knight story, and the English inns that gave given their name to the whole group of cultural strands. These strands are not causally linked, and their association may be denied, but a common derivation in human psychology may, to some, be useful.